What is a Yellow Jacket Wasp? There are several species of yellow jackets. These flying insects typically have a yellow and black head/face and patterned abdomen. Many say the pattern resembles stripes. The abdomen pattern can help an entomologist or pest professional identify specific types of Yellow Jackets. Yellow Jackets nest in the ground or in cavernous areas such as eaves, attics, etc. They feed on sweets and proteins and commonly invade outdoor activities. Yellow Jackets can be found anyplace humans can be found. Check near recycling bins or other areas where sugars are common but keep in mind these pests also feed on protein. 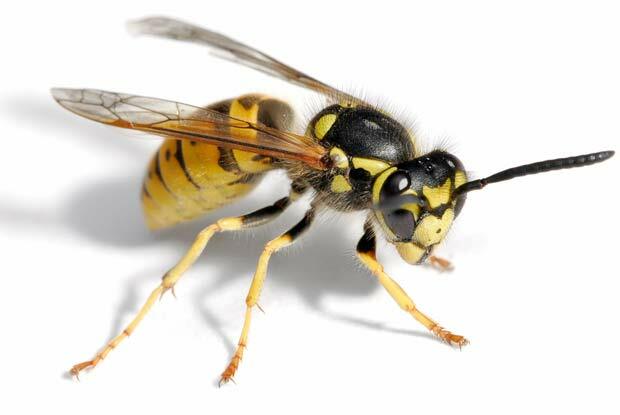 Yellow Jackets become more aggressive in the fall when the colony begins to die out except for the queen. Yellow Jackets pose significant health threats to humans as they may sting repeatedly and can cause allergic reactions. Stinging insects send over 500,000 people to the emergency room each year. Remain vigilant and call a pest professional if you suspect Yellow Jacket activity. Control requires specialized equipment and safety precautions. Do not leave sweet drinks or meats in accessible areas. For example, clean up and remove food and trash after picnics and outdoor events. We Can Help You Get Rid of Yellow Jackets!